100 moist whiteboard cleaning wipes in a practical dispenser tub. Micro fibre cloth for cleaning sensitive surfaces. 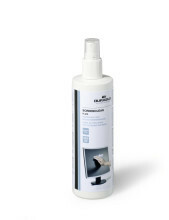 Specially designed for cleaning surfaces such as CRT and TFT screens including LED, LCD, Mobile screens,Ipad and other touch screens. Cleaning kit expecially for tablets, smart phones, touch screens etc. Incl. Jaquard microfibre cloth and 100 ml cleaning fluid. 50 individually packed, moist low-lint wipes pre-saturated with alcohol-free cleaning fluid. 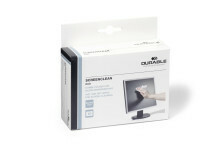 Environmentally friendly refill pack with 100 moist cleaning wipes, suitable for SCREENCLEAN BOX (product # 5736). 100 moist screen-cleaning wipes in a refillable dispenser tub. 200ml Screen Cleaning spray complete with cleaning cloth neatly packed into the lid. Individually packed sets of wet and dry cleaning wipes for computer monitors and screen filters. Ideal as a portable cleaning aid. Anti-static. Cleaning kit for streak-free cleaning of TV screen like Plasm, LED, OLED, LCD etc. HFC-free foam cleaner for whiteboards. Non-drip formula. For use with DRY CLEAN bonded fibre cloths. 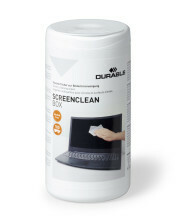 For gentle and streak-free cleaning of monitor screens, screen filters, laptop screens and PDA's. 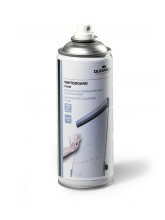 Highly effective cleaning solution suitable for use on most types of whiteboard. The fluid gently removes ink residue and leaves the whiteboard sparkling. Portable cleaning kit for tablets, smartphones, etc. 1 carry pouch incl. 1 microfibre cloth and 25 ml cleaning fluid.